The first rule of making a platformer is: you need to have reliable controls. This is true of most game genres, of course, but for platformers it’s critical – when level design and puzzles are built around precise movements and strict timing, the controls need to allow the player to meet those demands. It doesn’t matter how good any other part of the game is, if the controls aren’t spot-on, the game is going to suffer. In its current pre-release state, Clockwork is a great example of this. It’s a game with a beautiful art style, intriguing story, and some clever puzzle design built around an innovative core hook, but all of this is undermined by annoyingly sluggish controls. Atto, the main character, is slow to take off when you hit the jump button, floaty and unmanoeuvrable in the air, and lands with a momentum-killing thud. Changes in direction don’t come easy, with simply turning around costing you precious milliseconds that you often can’t spare. Wonky collision detection around platform edges means that even if you can fight through all of this to get that perfect jump, there’s no guarantee you’ll actually get where you’re trying to go. This makes for a puzzle platforming experience in Clockwork that’s challenging not because of clever puzzle design – though that is certainly present – but because it feels like you’re fighting against the game at every turn. Even when you’ve figured out the solution to an obstacle, actually executing it is a frustrating exercise in trial and error. To make matters worse, each new effort takes a long time due to the intricacies of the puzzles, making the trial and error process that much more tedious. In fairness, that repetitiousness comes from a really interesting and creative core hook: Atto, with the help of a mysterious, ghost-like being called Milli, is able to create “shadows” of himself in order to do lots of different things at once. Every now and then, you’ll pass a weird glowing portal; at any time after that, you can hit a button to go back in time to the moment you touched the portal while a shadow recreates your every movement since. Here’s a simple example: there’s a door that’s controlled by a pressure plate, but it’s only open while someone is standing on the plate – there’s no set and forget. You head over to the plate and stand on it for a few seconds, then rewind back to the portal. Now, your shadow will head over to the plate and stand on it, just like you did a moment ago, while you yourself can go and waltz on through the door that’s being held open for you as a result. Factor in the fact that you can have up to five shadows active at any given time, and this makes for some truly brilliant, creative, and exciting puzzle-solving – or at least it would, if not for the aforementioned control issues. By their design, the challenges require a degree of precision that the Clockwork’s physics just don’t allow for, and every failure means having to go through the rigmarole of setting up your shadows again. And, just when you think it can’t get worse, along comes an “action heavy” boss fight – which is basically just a series of the same sorts of puzzles, but with a great big lumbering monster chasing you and forcing you to solve them within impossibly narrow timeframes. In saying all of that, I held out against the tedium of the game itself for as long as I could because the story and the world that’s been created are so, so captivating. 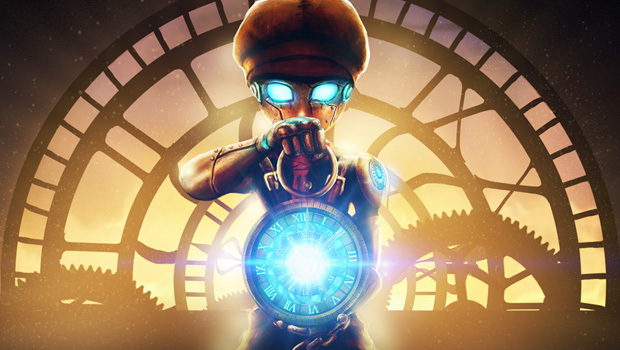 Clockwork follows Atto, a childlike robot outcast who has an obsession with fixing things. He lives out his days in a clockwork city, looking for things to fix and being constantly bullied by bigger, more functional robots. There’s more to Atto than meets the eye, of course, and the discovery of Milli within a centuries-old pocket watch he’s always sets them both on a path to uncover the city’s murky history. It feels almost like an adaptation of The Invention of Hugo Cabret within the world of SteamWorld, and that’s aided by a gorgeous hand-drawn steampunk aesthetic. Clockwork’s world contrasts the dullness rusted iron with bright, electric blue lights to great effect, and the ever-present cogs and contraptions ticking away in the background give the city a sense of liveliness. It’s alien and industrial, but somehow warm and inviting at the same time, which is a difficult balance to strike. It’s an intriguing, fascinating world, and one I would love to see more of and invest more time in. I want to uncover the secrets of the city, learn about Atto’s past, and find out why Milli was created. Sadly, the infuriating, unreliable controls, tiresome boss fights, and far too much reliance on repetitive trial and error have kept me from doing so, at least in this pre-release build. Here’s hoping that the full version of the game, releasing on Steam on October 11, will address some of these concerns. Clockwork has a lot of great ideas, and it’d be a shame to see them held back by something as simple but fundamental as good controls.